Seeing as we’re in a Boston frame of mind at the moment, after I FINALLY got round to posting about my visit, it would be probably be a good idea to strike while the iron is hot and to post this dish which is closely related to Boston and which I made about a year ago. Remember Moira? She of the classic American recipes, the giant American-style cookies and the great blog Who Wants Seconds? OK, so maybe some of you weren’t lucky enough to meet her in person but let me assure you that you can’t help but love her once you’ve met her. She and I hit it off almost immediately and spent many hours laughing raucously on the phone before finally meeting in person last year at the London blogger salt and butter tasting. When I picked her up from the station, she presented me with a huge package of American foods, direct from the shop on the nearby American military base. Among them were my guilty sweet secret (Reeses Peanut Butter Kisses), some peanut butter chips for cookies… and all the ingredients to make proper New England clam chowder. 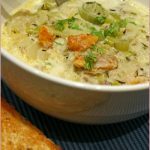 The word chowder has its etymological roots in the Latin word caldaria, meaning a place to warm things and later a cooking pot. This was also the root of the English word “cauldron” and the French word chaudiere – and it is obviously a short hop from there to chowder. 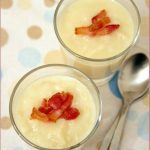 The early US settlers made chowder with what they brought on their ships, so their chowders often featured salt pork and ship’s biscuits – a tradition preserved today in the use of bacon in clam chowder and crackers on top. Chowders (or something similar) seem to have developed spontaneously in fishing communities around the world, probably as families stood around the cooking cauldron and waited for their ships to return from the sea. A portion of each man’s catch would be dumped in the chaudiere or cauldron to form part of the chowder for the collective celebrations later. Thus you in Chouder always must begin. Then Biscuit next which must be soak’d some Time. You may make a Chouder for a thousand men. You’ll have a Mess which some call Omnium gather ’em. What fascinated me about this, is its similarity to the South African tradition of potjiekos in which food is layered in a 3-legged cast iron pot and the above recipe: in both cases, food is layered, covered in liquid and cooked slowly until done. Who would have known – a South Africa-New England cultural link. Maybe that’s why Moira and I instantly hit it off – some sort of atavistic recognition on a subconscious level. Aaaah, the unifying power of food 😉 Her recipe below makes the most delicious, rich, creamy chowder – who needs seafood restaurants when you can make this at home? Fry the bacon in a large stock pot over medium heat until crisp (5-7 min). Add the onion and saute for another 5 minutes. Add flour and stir until lightly coloured. Add the clams, cream, parsley and salt & pepper to taste. 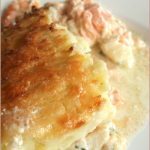 Bring back to a simmer and serve topped with crackers and accompanied by crusty bread for mopping up the last drop. How wonderful! Did she bring you the crackers too? I’m not sure I like clams, are they fishy? Blimey – I’m getting to sound like a right fussy cow. I do really like that photo though! PS. You seem to have had a posting frenzy, lol. It’s going to take me a while to catch up! It’s been years since I’ve had a proper clam chowder! Love the original recipe…but can’t imagine the size kettle you would need to feed 1000! Oh my word I am salivating as I read this……yum! Wow! I find the observer/guardian’s revamped (probably month’s ago) site and there you are featured on the page as one of their faves! Congratulations!